Finding free internet access in the US just means hunting down the nearest Wi-Fi hotspot. But in Brazil those are few and far between. 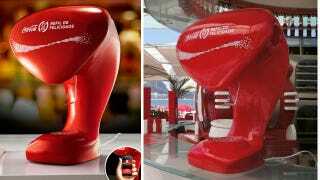 So Coca-Cola's ad agency, Ogilvy & Mather, created these Coke-branded machines that dispense free mobile data instead of sugar water. Installed at a Coke store located on the Copacabana beach in Rio de Janeiro, users still have to physically use the machine by pressing their phones against a fake tap which allows them to download a special Coke-themed browser. And every time they 'refill' their phones they're given 20 megabytes worth of credits which can be used in the browser to stream music, download weather forecasts, or browse social networks like Facebook or Twitter.